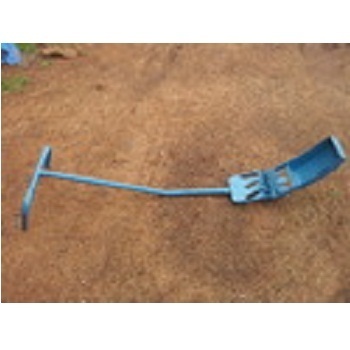 Clients can avail from us a superior quality range of Mandava Weeder. This is about five inches broad and can be operated between two rows. It removes the weeds and mixes them with the soil. We are offering at a market leading price. Subash Iron & Agricultural Industries was established in the year 1981. We are preparer, trader and of Finger Weeder, Mandava Weeder, Plastic Drum Seeder, Paddy Winnowing Fans, Peddal Paddy Thresher, Paddy Boiling Pan, Paddy Marker, Grain Storage Bins, Cono Weeder, Chairs, Dual Desk, Puddler and Ground Nut Decorticator. We are a strong committed team whose aim is to excel in the product being prepared to the full satisfaction of customers. We hopes to diversify further in it main line of work and at the same time is committed to quality and customer friendly service. All our products are widely appreciated for their latest designs, durability, fine finish, strength, etc. Catering to the requirements of agricultural sector from past 31 years, Subash Iron & Agricultural Industries introduces itself as a prominent Manufacturer and Supplier of Agricultural Equipment. The all-inclusive range of Agricultural Equipment that the company makes available to the clients located in different parts of the country comprises Direct Paddy Seeder, Rice Winnowing Fan, Pedal Operated Paddy Thresher, Groundnut Decorticator, Agricultural Puddler and Agricultural Weeders. Designed in compliance with the industry defined norms, the Agricultural Equipment range is tested by “Orissa university of Agriculture Technology”. At Subash Iron & Agricultural Industries (SIAI), we are functioning with the aim to excel in the domain by bringing forth the best Agricultural Equipment that can provide optimum satisfaction to the customers. SIAI endeavors to diversify its functioning wings and at the same time is committed to quality & customer-friendly services. Our stand in the market today can be solely attributed to our robust infrastructural unit and our team of competent professionals. We have armed ourselves with advanced production, quality testing, research and development and other requisite facilities that give us a competitive edge in manufacturing quality products. Our dexterous team of professionals supervises and oversees all the processes involved and ensures that we deal in only a disciplined range of flawless products. Moreover owing to our unrelenting efforts and commitment to quality, we have been able to garner a wide base of clients.